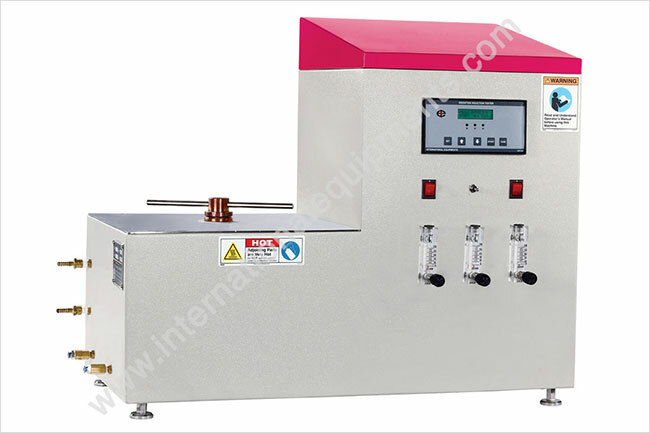 Oxidation Induction Test Apparatus is designed to check oxidation induction time (OIT) by Differential Thermal Analysis method (DTA) for polymers mixed with antioxidant additives. This test is helpful in analysing the de-gradability of polymers when subjected to oxygen flow. OIT Apparatus, OIT Equipment is known as Thermal Analyzer / OIT Machine, Differential Thermal Analyzer Apparatus, Thermal Analysis Equipment, OIT Instruments, Thermal Analyzer OIT Machine, Thermal Analysis Machine, OIT Apparatus, Thermal Analysis Products, Thermal Analysis Testing Machines, Thermal Analysis Tester, Thermal Analysis Testing, Thermal Analysis Instruments, etc. • The display & printout of Delta Temperature Vs Time graph along with Oxidation Induction Time result is Possible through your PC. The printout includes Party's Name, address, file name, date, batch no, Operator name, Sample weight, Set temperature, Start time, Finish time, Gas flow rate etc. • Calibration graph of melting point of indium metal along with printout facility is provided as per DOT Specification. • Cooling System: Cooling of barrel by water is provided.